Roller hearth furnaces are used for soft annealing of high speed steels, high alloy steels, cold heating and bearing steels. The design is engineered in such a way that it minimizes atmosphere consumption to improve economy. The control systems are used to calculate the process atmosphere. Various applications like annealing, hardening, preheating, normalizing and stress relieving are carried out in roller hearth furnace. Due to the versatile and efficient configuration, the smaller products are sent using a tray or basket and the larger products are directly sent on the furnace hearth for processing. The hearth is made of steel or ceramic rolls supported and driven externally from the furnace chamber. Continuous roller hearth furnaces come with electrically heated or gas fired configurations based on customer requirement. Roller hearth furnaces are used in the heat treatment of bearing parts as well other semi-finished goods like automotive & aerospace components, tubing, castings, bar stock, forgings, railroad components, precision machined components, gear parts etc. 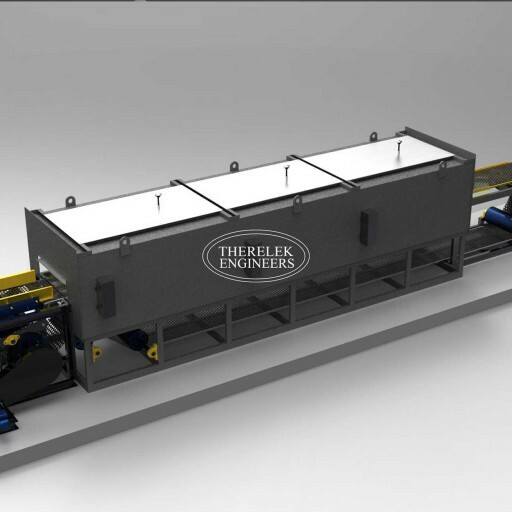 These furnaces can handle heavy loads in high volumes dues to its smooth movement of rolls. Roller hearth furnaces move the work piece through the hot zone with powered shaft mounted rollers that contact the work pieces or trays. Hence this type of furnace is used in the heating of long slabs wish is not possible through pusher type and walking beam furnace. These furnaces are used as single units for zone heating or cooling in a line of furnaces. Our furnaces are designed to reduce roll pickup and produce high quality material with uniformity.